Freedom Loving ~ Cutting Edge ~ Genius ~ Revolutionary ~ Alien. These words are often used to describe Aquarius. The interesting thing is this: what might be revolutionary for you could be old hat for someone who is on the cutting edge. Aquarius, and its ruler Uranus, are two of the most inventive forces in the zodiac. How can you use them this coming month to make a giant leap forward? Step out of your comfort zone. Try something new. It could be a new anything. Aquarius is the force that pushes us to go “where no man has gone before.” Taking a step in a new direction may seem awkward, or inauthentic, but if you’ve thought of it ~ and always wanted to try it ~ there is a seed within you. That seed can be planted at the New Moon. The four quarter phases of this lunation (phases 1, 3, 5, 7) are in fixed signs. If you have trouble beginning, push through. Once they’ve begun, the fixed signs have great staying power. The remaining phases are mutable (phases 2, 4) and cardinal (phases 6,8). The mutable signs welcome adaptation, while the cardinal signs need action. Begin your ritual by securing quiet space. You may like to light some incense or use an oil diffuser with an essential oil associated with Aquarius like patchouli, frankincense, or clary sage. Candles in an electric blue are a nice choice for Aquarius. A modern option is to use one of those little battery-powered tealights. Aquarius loves electricity! Take a few deep breaths to settle your mind. Focus for a few minutes on what you would like to accomplish during this Aquarius lunation. Keep it as specific as possible, with the idea that you may need to adapt it in some way. 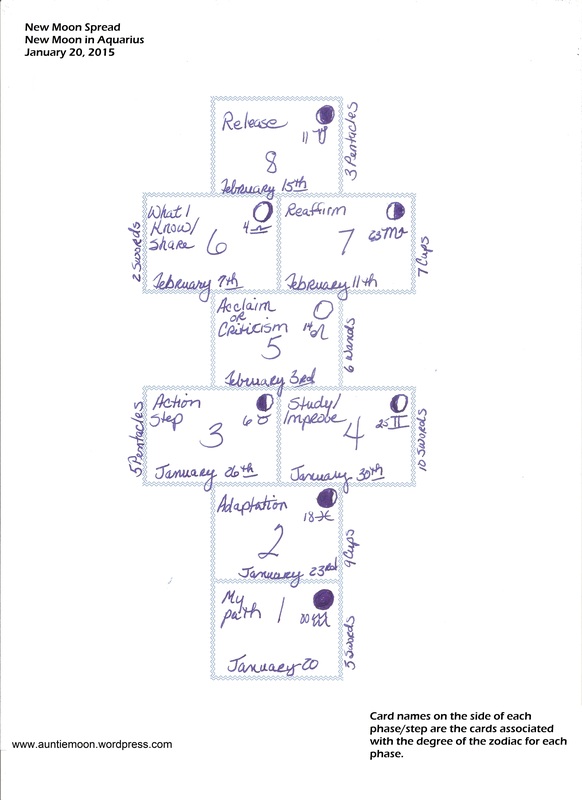 Print the spread and write your New Moon goal at the top, right above Balsamic phase (8). This is where you hope to be by February 18th, when this lunation ends. Lay out the cards noted on the side of each phase and draw an accompanying card for each phase, or just draw 8 cards and ignore the noted cards. Write down the name and some general observations about the cards you drew next to each phase. How can each phase guide you toward reaching your New Moon goal? As the month moves on, note your progress or hindrances with each phase. How does/did the card you drew help or deter you from reaching your goal? How well did you work with each zodiac sign? Use the noted zodiac signs for each phase to give additional insights on how to work through a phase. If you have a dated journal, note the sign and phase for each date, the house it touches in your chart, and what you hope to accomplish by that date. Take a mental journey through the phases. With each step, see yourself gaining momentum and advancing toward your goal. You may enjoy repeating the meditation at each phase. Begin by looking back from whence you came, bring yourself into the present phase, and then journey through the remaining phases. You may find yourself going places that you didn’t expect in your meditation. Allow the meditation to guide you toward your goal. 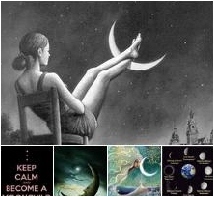 Sit quietly and reconsider how each phase can help you accomplish your New Moon goal. 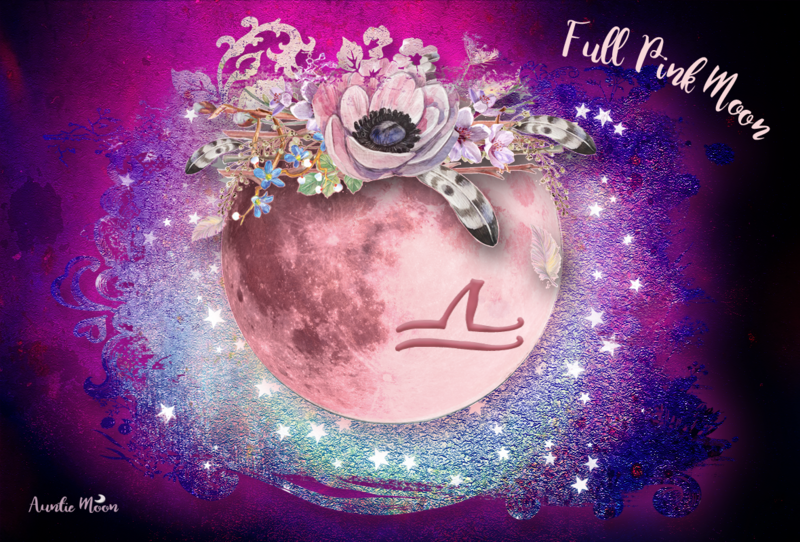 Envision yourself wrapped in the strong and comforting arms of the New Moon, the seed phase, and then glowing in the light of the Full Moon, and back into the darkness with the Balsamic phase. When the time is right, blow out your candle. Keep the illustration with your notes in a place where you can review it through the coming month. Here’s a short video I put together explaining the lunar phases as they unfold throughout the lunar month. If you’re new to Moon phases, this will explain the process. Just finished my worksheet with post it notes..in aqua. Thanks for this, I am starting to enjoy my New Moon rituals. I know my goals for this New Moon.